Industrial high pressure blowers, centrifugal and axial blowers, high temperature ventilators. 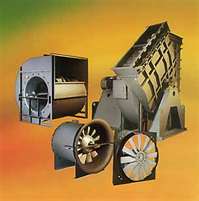 Sales for roof and wall exhaust and supply fan blowers, radial blower fans, tubeaxial fan blowers. Chicago Blower Heavy Duty Axial fans are available with adjustable pitch blades that are capable of more air delivery for the same horsepower. Fan efficiencies exceeding 70% are common. The primary reason for increased efficiency is Chicago Blower's unique fan blade design. The entire length of the fan blade surface generates air flow, not just the tip alone. The blower air flow is uniform all along the fan blade. Chicago Blower tubeaxial fans, vaneaxial fans and wall propeller fans are found throughout the world operating in industrial processes where performance, reliability and maintainability are of paramount importance. Ranging in diameter from 15 inches to over 84 inches, and with a variety of blower impeller designs, control systems and layout options, they form a comprehensive series of axial fans to satisfy virtually all industrial air moving applications. The majority of Chicago Blower fans can be grouped into four broad categories: with fixed blade pitch props, with variable fan pitch props and with controlled pitch props. Chicago Blower fans are capable of moving from a few hundred cubic feet per minute, to heavy duty adjustable pitch props with capacities up to 900,000 CFM and with static pressures from 0 " Water Gauge (WG) to 20" " WG. 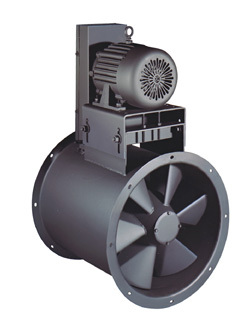 Chicago Blower axila flow fans are best buy for many industrial air moving blower jobs. Generally, an axial costs considerable less than a quality centrifugal fan delivering the same volume and pressure. They cost less to install since they are lighter, requiring minimum structural support. They can be duct mounted, taking up little space. Direct drive models mean faster start-up and the abscence of V-belt drive and fan bearings lowers maintenance costs. Adjustable and Controllabel Pitch Vaneaxial Fans feature an adjustable pitch blade wheel that permits matching your pressure/volume requirements exactly, and lets you make on-the-job adjustments to compensate for system changes. Chicago Blower Tybeaxial Fans have fixed blade wheels in capacities up to 100,000 cfm and to 5" total pressure. Canada Blower CBRE Reversible Flow Roof Ventilators are designed for use in commercial and industrial applications where there is sufficient ceiling height to create a temperature differential between the floor and the ceiling. These fan applications include factories, warehouses and large commercial buildings. Canada Blower CBRE Roof Recirculators function as regular power roof ventilators in warmer weather and as an energy-saving recirculation air system in cold weather. Each unit is equipped with a reversible fan that distributes warm ceiling air throughout the plant and reduces the building's heating requirements. With a flip of a switch it can function as a conventional roof ventilator. 2) for exhaust, supply and recirculation. Canada Blower fans are available fan wheel sizes are from 24" to 60", performances: to 50,000 CFM @ 1/2" WG.